Tottenham Hotspur is interested in making a bid to takeover the Olympic Stadium in east London after the 2012 Games, BBC London has learned. The football club has held informal talks with the Olympic Park Legacy Company, but has not submitted a bid for the 80,000-seat Stratford stadium. 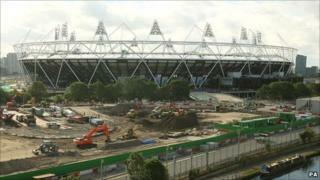 West Ham is the only club to have officially bid for the venue, offering to reduce the capacity to 60,000. Entertainment firm AEG, owner of the O2 Arena, is the other main contender. The Olympic Park Legacy Company (OLPC) is about to start serious negotiations with sport and entertainment firms about the venue. The BBC has learned that Tottenham has made contact with the OLPC, although the club's officials denied they had made an official approach. A spokeswoman said: "Tottenham Hotspur has not, to date, submitted a bid for the Olympic Stadium and, all things proceeding well with our current plans to build a new stadium within Tottenham, we see no need to." The club is currently working on a planning application for a new 56,000-seat stadium adjacent to their current White Hart Lane ground in north London, but has faced opposition from local police and national heritage groups about their plans. In March, West Ham announced they had teamed up with Newham Council to launch a bid to turn the Olympic stadium into a 60,000-capacity venue during the winter, which could then be used for athletics in the summer. Olympics Minister Hugh Robertson said he would be in favour of any solution which prevented the stadium from becoming a white elephant. "I'd be happy to have anybody in that stadia who uses it regularly and fills it up with people," he said. "What I want to avoid at all costs is the sort of thing we'd seen in other Games, which is big empty stadia a couple of years after the Olympics has moved on, with nobody using it at all." London 2012 promised a legacy for athletics and any takers for the stadium would have to keep the running track, although it would only be used once a year for the London Grand Prix event. There are also plans for another running track to be built in the Olympic Park just outside of the stadium which would be used for training by top athletes as well as local clubs and schools.